In my previous post, I described about Lamda expression and its usages. Now I am going to write about method references in Java 8. What is a method reference? As I described in my previous post, a lamda expression is an anonymous function. However, sometimes lamda expression is only calling an existing method. On the other hand, if the function code in the lamda expression is too complicated or has many lines, it makes sense to include it in a separate method. This is when method references comes in handy. Instead of writing a lamda expression, we can refer to an existing method. Based on the method type, there are 4 types of method reference syntax. Lamda expression in Java was introduced in Java 8. This is one of my favorite, cool features of Java 8. This blog is intended to help understanding what is it, where and how can we use it. In simple words, Lamda expression in java is an anonymous function. It is defined with the parameter list and the function body. Below is the syntax of lamda expression. So what is actually meant by this definition? Although we define an anonymous function here, this is actually like an implementation to a method in an interface. Also, we can assign this lamda expression to a reference of the interface type. REST APIs being exposed over HTTP mainly, there is a great advantage for APIs through HTTP Caching. Why caching is important for REST APIs? The biggest gain through caching for REST APIs is reduced server load, because the clients can store a cached response for sometime in their local store and access it without hitting the server. So it will result in a low response time to the client making things faster for them. Further, using E-tags (Entity tags), clients have the ability to check with the server whether the response has updated or not. The response body is sent to the client only if the response has changed from what client has cached. Otherwise a 304 Not-Modified response is sent without a response body. We'll discuss about ETags more later in this post. Not so long ago, I happened to do a research about HTTP/2 and how it affects performance of web services for my Masters. In this blog post, I am describing the basic details of the HTTP/2 protocol. HTTP/2 the latest version of Hyper Text Transfer Protocol, is an optimized transport for HTTP semantics. Hence, it supports all the core features of HTTP/1.1  . The aim of HTTP/2 is to be more efficient by addressing limitations of HTTP/1.1  . There are 5 main features of HTTP/2. MultiplexingHeader CompressionRequest prioritizationServer pushBinary message frames. Connection establishment in HTTP/2 HTTP/2 also uses the same “http” and “https” URI schemas and same port numbers as HTTP/1.1. Therefore, implementations processing requests for target URIs with“http” and “https” should have a way to discover whether the next hop supports HTTP/2 or not. The determination procedure for HTTP/2 support is different for “http” and “https” URIs  . 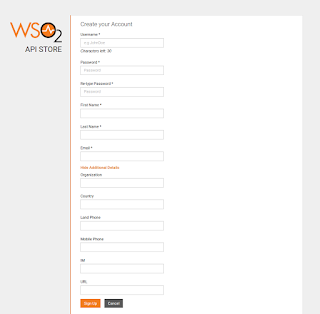 WSO2 API Manager allows on boarding new users to the API store through a Sign-up page. The default sign-up page has set of mandatory and optional fields for user to provide details. However, there can be cases where one needs to customize the available fields by modifying available ones or/and adding new fields. This can be easily achieved in WSO2 API manager since the fields are loaded dynamically from the user claim attributes. So this post explains how we can customize the default Sign-up page. By default API Store Sign-up looks as below. Note that this blog posts shows how to do this in APIM 2.1.0. Let's say you want to add a new field called 'City' to Store Sign-up page. This post provides step by step instructions on how to achieve this. 3. Enter the below values for the new claim.